Hue is intimately connected to the imperial Nguyễn Dynasty, based in Hue, who ruled from 1802 to 1945, when the Emperor Bao Dai abdicated in favor of Ho Chi Minh's revolutionary government. The city went through tough times during the Vietnam War, when it was conquered by the Viet Cong and held for 24 days, during which the VC slaughtered around 3,000 people suspected of sympathizing with the South, being a highschool graduate or Christian. In retaking the city American forces initially didn't use artillery or air support to avoid damaging ancient buildings but due to heavy casualties these restrictions were relaxed and the city largely destroyed. Hue is easy to get a grip on. The main landmark is the Perfume River (Hương Giang), with the old city and the Citadel on the north side and the newer city, including most hotels and restaurants, on the south side. Much of the riverside has wisely been done up as a pleasant promenade and park dotted with bizarre sculptures. The tombs are located further south in the outskirts of Hue. Hue's weather is infamously bad: the Truong Son Mountains just to the south seem to bottle up all the moisture, so it's usually misty, drizzly or outright rainy. Things get even wetter than usual in the winter rainy season, especially from February to the end of March. To be safe, bring along an umbrella any time of year. Don't forget to bring a sweater and jacket in winter as it can get rather chilly, with temperatures falling to as low as 8 degrees at night. Alternatively, when the sun makes an appearance for a day or a week, it can reach 30 degrees. It's usually quite dry during the summer months, when the temperature can reach the high 30's. Summer rains can be heavy but brief, and often arrive unexpectedly, whereas February rains can last for weeks. The best description for the weather in Hue would be "changeable". A second-class sleeper from Hanoi to Hue on the SE1 (leaving Hanoi at 19h00) cost 710.000 on October 25th, 2012 (for a hard-sleeper, 6-person cabin, middle bunk ; bottom bunk is a little more pricey while top bunk is the cheapest). A soft sleeper (first class) bunk costs around 900.000 dong on March 18th, 2016. They will most probably try to sell you this option, which gives you more privacy and comfort. There are food and drink carts on the train, selling dumplings, instant noodles, coke, beer and coffee at reasonable prices. Tickets can be bought at the station, or in hotels/travel agencies. The latter will mark up prices by ~50% (e.g. $60 for a $40 fare), but saves time and difficulties waiting in queue and communicating with the train staff. Note: the station counter only takes cash. From the train station, it is about a 20min walk to most backpacker hotels (around Pham Ngu Lao street) but it is straight. Taking a motorbike driver can be bargained down to 20,000-30,000 dong. Daily bus from Hue to Hoian running by a local tour operator in Hue city. Regular buses run between Da Nang and Hue (around 50,000 VND). An Phu 11 Nguyen Tri Phuong. Bus leaves 8.00 AM and 1.30 PM. Normally you can get train from Danang city to Hue or Tourist Bus from Hoian or ride motorbike by yourself to Hue but you can also travel to Hue city on private car. You can contact with a local company to get in there. Distance 145km -4 hours of driving. But the most advantage of private transfer from Hoian to Hue is you can stop on the way such as Marble Mountain, Cham Museum, Lang Co Beach, The Cloudy Pass and Elephant Spring for swimming before get to Hue while others are non stop. And of course they are the cheapest way to travel and saving money but should we pay what should we get. Cost for 4 seats car US$56, 7 seats car is US$66 and 16 seats car is US$84. They also support for picking at Hue airport to Hue city center for 12$/4 seats car (the cheapest private car). You'll have a couple bathroom stops (bathrooms not necessarily available) and at least 2 or 3 eating stops. From Pakse VIP (not really) buses leave at 8am arriving in Hue 12-13 hours later. Local buses leave Pakse in the evening. Tickets can be bought from travel agents in central Pakse. Be prepared for a no air-con ride. If you travel with big group, you should arrange private car rental with hotels or any travel agents in Hue With cyclos and motorbikes, all of the usual disclaimers apply: negotiate a price ahead of time, and don't be afraid to walk away if they're asking too much. No trip in Hue should cost more than 20,000 dong. Many of the motorbike drivers double as pot dealers, and you may be offered to buy marijuana along with your ride. Hire a motorbike for 100,000 dong locally. Fuel costs 25000 Dong per litre.Join the locals as they swarm across the bridges and along the main roads at a leisurely pace. If you're not familiar with motorbikes you may want to practice on smaller, less busy roads first. Gas stations can be found at some of the major intersections in the city - ask the person you are renting from to mark any they know on your map.Note that a map is a Foreign concept- nobody understands them, NOBODY. Make sure your motorbike comes with a helmet, as you can be fined otherwise. You can also buy helmets for 50,000-125,000 VND. Helmets priced at 50,000 will not offer much protection in a crash - these are sold so people can avoid fines more than to offer real protection. For motorbike with driver, small hotels have connections to freelancers. You may be lucky to have an English speaking (a bit mumbled but knowledgeable) guide/driver/US army veteran for all 6 tombs (the 7th is inaccessible) including those locked and forgotten for lack of tourist interests plus three temples and the emperor's arena for one day and have extra time in the early afternoon for a beer and some Vietnamese do-it-yourself spring rolls and the famous Hue pancakes for just $10. The DIY spring rolls and pancakes are not free though but they are the best for only 45,000 dong. Cycling is also a good option, with plenty of bikes available from 25,000-30,000dong/day (March 2012). It is a cheap an interesting option for shorter trips, such as for visiting the Tu Duc Tomb (around an hour from Hue, with some steep but doable sections). For directions, just check the walking option in your favorite map site. At Tu Duc, you can leave your bike at the entrance for a reasonable 5000 dongs. You can stop for coffee or for a soup on the trip back to Hue at one of the many family-owned shops along the route. The former imperial seat of government and Hue's prime attraction, this is a great sprawling complex of temples, pavilions, moats, walls, gates, shops, museums and galleries, featuring art and costumes from various periods of Vietnamese history. Thanks to its size, it is also delightfully peaceful - a rare commodity in Vietnam. It is pretty huge; plan to spend at least 3 hours there. The citadel was badly knocked about during fighting between the French and the Viet Minh in 1947, and again in 1968 during the Tet Offensive, when it was shelled by the Viet Cong and then bombed by the Americans. As a result, some areas are now only empty fields, bits of walls, and an explanatory plaque. Other buildings are intact, though, and a few are in sparkling condition. For the rest, while restoration has been going on for 20 years, there is still quite a long way to go. Allow several hours to see it properly. Entry 150,000 dong for adults 30, 000 dong for children 7-12 (april 2015) (for foreigners, less for locals of course) and it is open 06:30-17:00. Inside you can pay $1.50 (75,000dong) to dress up in the King or Queen's clothing and sit on the throne for a fun photo opportunity. Ngọ Môn. The main southern entrance to the city, built in 1833 by Minh Mang. The central door, and the bridge connecting to it, were reserved exclusively for the emperor. Climb up to the second floor for a nice view of the exquisite courtyard. The Ngo Mon Gate is the principal entrance to the Imperial Enclosure. The Emperor would address his officials and the people from the top of this gate. Trường Sanh Residence. Translated as the "Palace of Longevity", the Truong Sanh Palace was the residence of King Tu Duc’s mother, Empress Tu Du, under the Nguyen Dynasty in the 19th century. It lies in Tu Cam Thanh, one of the two major parts of the Hue Citadel. Currently under renovation, the project, estimated to cost almost VND 30 billion (roughly US $1.8 million), includes the restoration of Lach Dao Nguyen, the Palace's protective moat, decorative man-made rock formations and mountains, bonsai gardens, and the palace gate. The restoration is expected to be completed in 2009, but this is doubtful. While not officially open to the public, it is possible to enter the grounds and should be seen, as even in it's overgrown state, it's beauty is recognizable. Hue Jungle Crevice. When the Viet Cong briefly over ran Hue they rounded up 3000 of Hue's citizens and officials. Fearing the prisoners would slow them down in hot retreat, they tied them up and pushed the people over the cliff into the crevice. The other great attractions in Hue are the Tombs of the Emperors, which are located along the Perfume River south of the city. They are accessible by taxi or bike from the city, but the best way to see them is to hire a river boat and go for a cruise. Plan to make a full day of it, although if you rent a car, it will take only a few hours to see those worth seeing. Group tours usually cost about 200,000 VND, which includes a lunch aboard the boat. The lunch consists of small portions of rice and vegetables, you are given the option to order more dishes at a cost. The cost of the tour does not include admission to the tombs (100,000 dong apiece for foreigners as of April 2015 - ensure you count your change carefully if paying by large denomination note as short-changing can occur) or the cost of a motorbike from the wharf to each tomb. If you're with a group, the price should be set by the tour company at roughly 25,000 dong for each round-trip. Choose a tour with as few stops as possible. Some companies lard up their itineraries with visits to silk farms and a few pagodas, promising to fit everything in neatly, however tour companies aren't noted for their time management, and you'll wind up rushed along and frustrated for at least one of the tombs. If you're traveling on your own, boat hire or a motorbike and driver should cost somewhere around US$20, again not including tomb admissions. All of the tombs can be walked to from the wharfs in anywhere from ten minutes to half an hour. The paths are mostly obvious, but you still probably shouldn't try it without a map or a terrific sense of direction. Most of the tombs are open from 7:30AM or 8AM to 5:30PM, depending on the season; note that the tour groups arrive around 10AM and leave around 3PM in order to get back before dinner, so plan accordingly to avoid the crowds. You'll be glad you did. The tombs are also easily reached by bicycle, although there is a shortage of good maps of how to reach them. Ask your hotel about bicycle rentals and maps, and be cautious on the crowded and potentially potholed roads. This is probably the most inexpensive (and enjoyable, if you enjoy cycling) way to reach the tombs. There is no discount for Vietnamese visitors, the rather hefty admission price is the same as for foreigners. Tomb of Gia Long (20km) - the most remote of the tombs, quiet and fallen into disrepair as Gia Long, the first Nguyen emperor, was notoriously despotic. As of Sep 2015 it is rumored to be closed for visitors. Tomb of Minh Mang (12km, 7am-5.30pm, 100,000 VND) - Possibly the best of the lot, situated inside a wall and covering several hectares. Woodland and water make it a very relaxing place to be- Minh Mang was definitely a country boy at heart! The main buildings are arranged on an east-west axis, including a courtyard surrounded by warrior statues and several temples and pavilions. Several bridges cross two lakes before the axis ends before the vast burial mound (which is circled by a fence). If you're dropped off by boat, note that there is a stretch of souvenir sellers to navigate during the short walk to the mausoleum entrance.Same goes for the car/coach/motorbike park, but they are only trying hard to earn a crust. Bike park is only 5000 dong. Expect to spend around an hour. Tomb of Thieu Tri (8km, 7am-5pm, 40,000 VND) - built in 1848. This Emperor and his wife were the most revered and loved throughout the country. Although he only ruled for 7 years, he was the most sorely missed. In a time of strife and economic problems, he was careful with the country's Treasury and made sure to improve his people's living standards. His last will was that he be placed in a tomb that was not extravagant, parting ways with the tradition of creating lavish final resting places for their Emperors. The tomb is still mostly being restored, so as of Sep 2015 there is not much to see, expect to spend no more than 15 minutes. Tomb of Tu Duc (7km, 7am-5pm, 100,000 VND) - Constructed from 1864 to 1867, the complex served as a second Imperial City where the Emperor went for "working vacations". Tu Duc's contemplative nature and poetic spirit is reflected in the landscape and arrangement of the 50 buildings that at one time stood here. A vast, sprawling complex set around a lake, with wooden pavilions and tombs and temples dedicated to wives and favored courtesans (Tu Duc had 104 to choose from). The courtesans' quarters are in ruins, with only outlines and crumbling walls left amid waves of overgrown grass and silence, but other areas are stunningly well-preserved. The Emperor's tomb itself, tucked away in the back, is surprisingly modest - the final courtyard is nearly empty with just a stone coffin in the middle. (The tombs of Empress Le Thien Anh and Emperor Kien Phuc, who briefly ruled in 1884, are also located here.) Try to dodge the crowds for this one. Expect to spend an hour and half. Tomb of Dong Khanh (8km, under construction, still free as of Sep 2015) - built in 1917. Only the entrance gate and a temple facade is ready. Expect to spend no more than 5 minutes. Tomb of Khai Dinh (10km, 7am-5pm, 100,000 VND) - dating from 1925, this is the best preserved of the lot and, while comparatively compact, quite grand at first sight. While it follows the classic formula of forecourts leading up to the tomb of the Emperor, complete with statues in attendance, architecture buffs will spot some European influences. The tomb itself is completely over the top with incredibly detailed and opulent mosaics of cavorting dragons. Try to get to this one early, as it is a favorite stop for Asian tour-bus groups. Also, you may want to leave the tourist path and head up the hill on the right side of the tomb, where a small temple stands. You will have a great view of the tomb and the valley it faces. Expect to spend around an hour. Inauguration event on September 15, 2016 for the new "I Love Hue" sign in Hue, Vietnam. I Love Hue Sign - located in the February 3 Park ("Công viên 3 Tháng 2" in Vietnamese) on the banks of the Perfume River sits Hue's newest icon. The sign reads "Tôi ♥ Huê", meaning I Love Hue in English. The sign was inaugurated on September 15, 2016. Great spot for a photo with a true sense of place! Thien Mu Pagoda (4km) - perched on a bluff over the river and housing some very fine gold and silver Buddha images. The Thien Mu Pagoda overlooks the Perfume River and is the official symbol of the city of Hue. Thien Mu means "elderly celestial woman", and refers to an old legend about the founding of the pagoda. Brimming with opportunities for great photos. Phu Bai Airport is a must-see if you are interested in the war. The airport was a dirt strip during the Indochina War. Then, during the Vietnam War, an American garrison was assigned there and built up the airport with concrete bunkers, a paved airstrip, and a few other luxuries. The airport was vital in keeping Hue supplied during the Eastertide Offensive of 1972 when "Charlie jumped the line". The airport retains the original buildings built by the Americans; however, they have been retrofitted for use by the Vietnamese. Thanh Toan Bridge - a few kms out of the city is this beautiful wooden footbridge. It is a great place to observe rural life, and is often full of locals escaping the sun. While it might not be worth the trip on its own, it's definitely worth a stop if you are in the area. Private Hue Tours - http://privatehoianguide.com : phone +84 128 801 5885, email: xuantuvietnamtours@gmail.com, websitehttp://privatehoianguide.com. If you come to Hue and expect to do something personal local experience, private tour is the best choice. Dalat Angels - Vietnam Motorbike Tours, phone +84 937 171 399, emai: info@dalatangels.com, website DalatAngels.com. Whether you want to explore Vietnam on a motorbike of your own or prefer to ride along as a passenger with one of our licensed drivers, Dalat Angels caters for anyone with a sense of adventure. When you travel with us, you’re not just customers but also friends. We guarantee it will be the best thing you do on your holiday! Hai Van Pass Motorbike Tour- Many tour companies and hostels offer "Top Gear" motorbike tours over the Hai Van pass, through Da Nang and over to Hoi An. For someone who knows how to properly operate a motorbike or scooter this can be a very rewarding experience. Keep in mind that you will usually go through Da Nang at around rush hour in the afternoon, which can be very hectic and potentially dangerous if you are an inexperienced rider. Guided trips will run you $30-40, unguided will be much less than that. Hue Motorbiking Adventures - This motorcycle tour company will take you on their comfortable motorbikes around the city, or on a one or multi-day trip to Hoi An. The drivers are professional, fun, and safe. You just sit back and relax while they drive you around. Blind massage - make a valuable contribution to the local community at the institute for the blind,180/1 Phan Boi Chau street (/1 mean's the buildings are on the left, 50 metres down a side road behind 180 on Kiet/Alley) on the right up the hill about 1km past the train tracks (look for a small blue sign with English). 60,000 dong/hour for good, proper massage and 30,000 dong/hour for herbal steam-bath. All of the staff work and live in this facility, and speak a little English. This is where the locals go, so ask your hotel receptionist to call them ahead for an appointment. Brilliant experience an a "must do". You are left for half an hour in a steam room with herbs, followed by a full hour massage. Phone 0543886505. Correct as at Oct 2015. My An Hot Spring and Spa - 7km from Hue on the way to Thuan An beach. US$3 for foreigners to use the swimming pool and 2 hot spring pools. The water here has a high sulfur content, purported to have health benefits. .
Alba Thanh Tan Hot Springs - about 30 km from Hue Center. This is one of the best hot springs resort in Vietnam with a wide range of activities to keep your time full. Every activities here are meant to strengthen your health. Take a ride with Zipline, and Highwire, or fun water games to get you sweat. Then relax your body, calm your mind with an outdoor hot springs bath, and followed with massage and spa therapies. Rooms available from US$35/room/night (breakfasts and entrance tickets included). Day entrance ticket is US$5-7/pax. 3 restaurants & 2 bars for your choice. Thanh Tan mineral water source is also supplied water for bottling the 5-star local Alba Natural Mineral Water. Thuan An Beach - 15km from Hue. Ho Chi Minh Museum 6 D Le Loi - Free admission. Contains photos and information on Ho Chi Minh as well as the history of Hue in photographs. Closed on Sunday. Scams There are several "massage parlors" in town (catering strictly to the tourists) that are less than reputable, where the main attraction seems to be attractive girls flirting and chatting up the customer for a big tip. Don't bother asking your hotel for a recommendation, they will try to steer you to the one that provides them the biggest kickback. Also, if buying a bus-ticket, shop around and let them know you are looking for the best price. A bus ticket to Ho Chi Minh City runs around $20-$30, but you will hear quotes as high as $80. However, you can expect prices to be somewhat higher around certain holidays, such as Tet, when everyone is trying to get home. Be very clear on the price when you take a cyclo. (See cyclo section)Beware tour companies that may steer you towards high priced meals. The most famous local dish is bún bò Huế, a noodle soup served with slices of beef and lashings of chili oil. Another tasty local treat is sesame candy (mè xửng), which is peanutty, chewy and quite tasty if fresh, and goes for under 10,000 dong/box. Nem Lui is a dish of sweet, minced pork around bamboo sticks grilled over hot coals. Banh Khoai is a "pancake" filled with bean sprouts, shrimp and pork. Bun Thit Nuong is delicious barbecued pork served with vegetables and noodles. Banh Beo is a sort of an appetizer. Sticky rice with shrimp and pork dipped in a sweet fish sauce. Add chilli to the fish sauce (if you want) then pour it on the 'rice'. If you are a streetfood-lover then Hue is the right place for you. For breakfast, you can get a hot and filling soup between 20-40,000 dong. Don't be afraid to try one of the places with tiny plastic chairs - if you see locals eating there, it's probably good. If you are more into sandwiches, try the pork and vegetable filled baguette that can be bought for around 15 - 25,000 dong from any of the hot-dog carts. There are also some french-inspired bakeries, some selling excellent croissants and pain au chocolat (expect to pay around 20,000 each). Local baked goods include decent donuts for 3,000 a piece. Pancakes are also a good choice. Dong Ba Market, Chương Dương, Phú Hòa. This is a particularly interesting flea market to walk around and has a range of food stalls selling local dishes for 10,000-40,000 VND. Anthony Bourdain came here in an episode of 'No Reservations' to sample to Bun Bo Hue. Scam alert: You should be very clear on what you want to order and make sure the price is listed, which it usually is. Do not accept any additional dishes other than what you order. Some of the food stalls have started to make a habit of bringing you loads of low quality food without you asking for it. If you eat it, they will charge you about ten times what the snacks are worth. You can sit down expecting to pay 30,000 VND for a meal and get hit with a bill of 200,000 VND if you're not careful. Stick to what you order from the menu, and if they bring you anything else, send it back. Nina's Café, 16/34 Nguyen Tri Phuong , small family restaurant located in a substreet of a substreet. Somewhat affordable (for tourist food prices). This restaurant is almost entirely patronized by foreign tourists, some of whom really enjoy the food. But others think it is bland and catered to Western tastes. For a local experience, go elsewhere. You and Me, 38 Tran Cao Van. This place appears to have dropped in standards or changed hands. Previously recommended, its 'speciality' pancakes are now inedible, meat dishes bereft of meat and staff are pushy (they even drop prices to encourage you to take the "fery fery good" (actually fery fery bad) spring rolls. Reasonably priced but still very bad value. Bottled beer is good! Leave it at that. Bun Cam, 38 Tran Cao Van st, Very popular with locals, but only opens for the early morning, about 6AM until they run out of soup. This is the real thing, local style, not adapted for the Western palate. Try it with their chili sauce, also a local specialty that shouldn't be missed. The lady sitting behind the soup cauldron is Cam, the cook and namesake of the business. She only speaks Vietnamese, but just look in the pot, like the locals do, and point at what you want. The price varies with how many different things you choose. Bún Cha Hà Nôi, 20 Nguyen Tri Phuong. This family-run restaurant only serves original HaNoi-style Bun Cha: a dish with pork spring rolls, some meatballs, cabbage and carrot sauce with hot peppers, and bundles of noodles to dip in said sauce. Opened April 2011 and the owners are very welcoming to foreigners. As with all Vietnamese dishes, the hungry may have to order twice but with a price of 25.000 dong, that ain't too bad. Nice atmosphere while keeping the genuine atmosphere of a local restaurant. Banh Khoai "Hong Mai", Dinh Tien Hoang - Nguyen Bieu corner Str. (Inside the Purple Forbidden City) is known as the best Banh Khoai(Pancake) in Hue. This is a family restaurant. Nem Lui (minced pork grilled with lemon grass on coal) and Banh Beo also recommended. Bánh Khoái Lạc Thiện (Trần Hưng Đạo st). Brown eyes restaurant 1/34 Nguyen Tri Phuong - Tel: 054 832572 . You need cheap food and big plates? Go to Brown Eyes and you will be satisfied for breakfast, lunch or dinner. Suitable for young people. Changed name, and now bad service. Friendly restaurant, D Pham Ngu Lao, an excellent choice with charming staff and a wide range of Vietnamese and European food. Opened in 2005 and owned by a Vietnamese family, Friendly restaurant is in the town's centre. Mandarin Café, 24 Tran Cao Van. Having been forced to move many times,the owner, Mr. Cu has purchased property and built on this new location to ensure that he won't haveto move again anytime soon. The owner is also a good photographer and many of his pictures hang on the wall. The food here is consistently good with local & Western favorites. Try his banana pancakes. They are as good today as they were 10 years ago. Phuong Nam Cafe, 38 Tran Cao Van - Tel: 054 3849317 is a nice little restaurant with decent but very cheap food and excellent fruit shakes. Hot Tuna, 37 Vo Thi Sau (Corner of Vo Thi Sau & Chu Van An) - Tel: 84.54.3616464 is a nice restaurant, friendly staff and our meals were excellent. Recommend the chicken breast with mushroom sauce and mashed potatoes, 80,000 Dong and well worth every bit of it. The best I have had in Asia. Duck also quite nice. Meals range from 40,000 (sandwiches) to 160,000 (fish) and have lots of options in the mid range. 8 Dinh Tien Hoang. Food is delicious and well priced. Many Hue specialties available and the owner will show you how to eat them if you look puzzled. Many other dishes also available. Bun Bo Bu 30,000vnd, Nem Lui 30,000vnd, Bah Khoai 20,000vnd, Bun Thit Nuong 30,000 vnd, Banh Beo 20.000vnd. Hue Waterland Bar-Restaurant, 35 Chu Van An St. Tel : 054.3844844. Dining, lunch, breakfast. They serve Vietnam cuisine and Western food. Such as Bun Bo Hue, Banh Loc, Banh Beo, Banh Nam, Nem Lui, burgers, sandwiches, pizza, spaghetti, spring rolls, fish, shrimp, pork, noodle, rice. In tourist center, just few minutes to Perfume River. Garden view with bamboon tree and candle. Không Gian Xưa, Điện Biên Phủ st. A nice place to enjoy delicious local cuisine in a well designed traditional style building. Ong Tao, 31 Chu Van An. 054.823031. Excellent traditional Hue food, try the meat rolls (wrapped in mint leaves) or the fried spring rolls -incredibly crunchy-. Not too crowded, kind of hidden in a first floor. Don't miss it. All dishes (US$1-7) have small and big versions, so you can order a few. Tinh Gia Vien, 20/3 Le Thanh Ton, tel. +84-54-522243. Wonderful old Hue-style nha vuon garden villa on a quiet side street, formerly the residence of a princess, converted by a bonsai enthusiast into a restaurant serving Imperial cuisine. There are three set menus at US$15/20/25 ("big", "bigger" or "biggest", according to the menu) but all sets have 11 courses and are guaranteed to fill you up. The food wins full points for presentation, but is unfortunately somewhat toned down for the foreign palate. Ancient Hue Royal Cuisine and Gallery  : One of the biggest restaurants in Hue. Prices are good, food is excellent, extremely clean. All is served by a professional staff, international experienced chef. It is also a complex of ancient houses among huge garden area, which makes you feel comfortable once you come here. Also, the food carvings are memorable, and the service is outstanding. Expect to pay between $30 per person, cheapest wine was $25 a bottle and beers started at $3.50 rather steep when you are paying $1 for a beer anywhere else. Well worth a visit, recommend getting a taxi there as quite difficult to find even with google maps. Thanh Lien Quan Chay, Approx. 52 Nguyen Cong Tru. Delicious and cheap buddhist family restaurant, very friendly staff, easy to miss from the street, look for a sign with TATA. Rice with vegetables, tofu and other delicious morsels: $0.50. 4-person hot pot: $2. Bo De, D Le Loi. Run by the Huong Giang travel company. Extremely popular with locals. Serves delicious vegetarian appetizers and entrees. Expect to fill yourself for US$2-3/person. While the restaurant serves truly wonderful cheap vegetarian dishes, for some reason the staff is very unfriendly with foreigners. Half of the dishes listed on the menu are not available. Lien Hoa, D Le Quy Don. In the grounds of the Lien Hoa pagoda, across from the football stadium. Monks and nuns frequent this restaurant during lunch. A small shop near the door sells Vietnamese language Buddhist texts, prayer beads and icons. Com Chay (vegetarian rice) Is near the River on on the 'newer side' it has simple, but good and cheap vegetarian meals. Tinh Tam (or "calm soul") located at 12 Chu Van An tel.823572. Answering the question "Who would Buddha rip off? ", this Buddhist restaurant in the backpacker district has a little scam going. There are two menus- an English one with strange dishes at high prices, and a Vietnamese one with normal Vietnamese dishes at normal prices. If you try to order off the Vietnamese menu, the owner will claim those dishes are not available. If you do succeed in ordering a Vietnamese dish, the owner will bring out an unidentifiable dish and claim it is what you ordered (going so far as to claim a plate of noodles and tomatoes was "pho") at 4-5 times the price. If you complain, the owner suddenly doesn't speak English. You can find plenty of unhappy customer reviews on the internet of this place. To avoid. Price: Vietnamese: 5000d / Other races: 40,000-50,000d. Quang Tinh, 91 Vo Thi Sau, in the backpacker area. 6am-10pm. Very simple place, menu of noodles, rice, and so on, starting at 10,000d. Also sells cigarettes and hard alcohol. Café on Thu Wheels, 1/2 D Nguyen Tri Phuong. It's a little bar owned by the charming lady Thu. Great value, great service. DMZ Bar & Café, 44 D Le Loi. Stays open late.Very expensive drinks. There are lots of small cafés (quán cafe) in Hue. Going out for coffee is a favorite local pastime. Most Hue people wouldn't think of starting the morning without meeting friends over a glassful. Most coffee shops open for business in the morning, close down from about 10:30 or so until late afternoon, then open again for the after-work and evening crowds. Do try the local style, iced, either with condensed milk, or black, which means with sugar. In the South, the iced coffee comes in a tall glass with lots of ice and lots of syrupy milk. In the Central area, the glass is much smaller, and the coffee is usually stronger. If you don't look Vietnamese, you may be served a weaker coffee, or if you order cafe nong (hot), they will also give you an extra glass of hot water to pour in. Do try your coffee first, to taste it the way the locals like it. Something like an iced, sweet espresso, with chocolaty overtones. 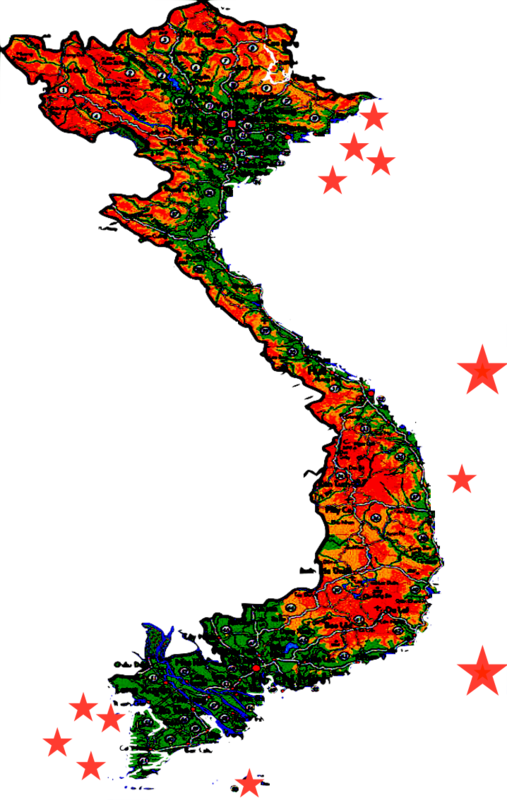 Generally 6,000d-8,000d for Vietnamese people; 10,000d+ for foreigners. Sidewalk Coffee - Opposite 30 Bach Dang st. Go local and try some delicious early morning coffee with chocolaty overtones, hot or iced, while watching river life on the canal. The woman who brews it up also offers banh mi, french bread with your choice of fillings. Another woman shares the same patch of sidewalk and sells very reasonably priced banh canh, a popular local breakfast soup. A real plus here is the cleanliness. The coffee glasses are spotless! Open from about 5:30 a.m. until 9 or 10, when the coffee and food are sold out. After your coffee, you can continue walking along Bach Dang to reach 2 famous local pagodas, both nearby. There are plenty of cheap traveller hotels and mid-market hotels in Hue, as well as a couple of expensive giants. The largest cluster is around the short lane ofPham Ngu Lao (including Le Loi, Hung Vuong, Chu Van An, Nguyen Cong Tru). It's not quite as big (or backpackery) as its Ho Chi Minh City namesake, but still a definite tourist magnet. Across the river, near the citadel there are a few budget hotels on and around Dinh Tien Hoang. Waterland hotel.add : 35/42 Nguyen Cong Tru.st.Huecity .Tel : (+84.54)3935435 / 3935735 .Email : info@waterlandhotel.com .Website: www.waterlandhotel.com .Waterland Hotel is aBoutique Hotel located on Nguyen Cong Tru street, just a minute's walk to the famous Perfume River. It offers a modern and diverse range of facilities and services. All the rooms in the hotel have wooden floors and are equipped with IDD telephone, air-conditioning, cable TV, refrigerator, bathroom, (bath-tub and shower), hair-dryer, coffee and tea making facilities, private computer with ADSL for free. Holiday (Diamond) Hotel, 6/14 Nguyen Cong Tru, . Exceptionally good value. The spotless, airconditioned rooms ($25-35) are well-furnished with modern amenities, and include lockable wardrobes. The included breakfast is substantial. The staff are very attentive, and will learn and try to remember your name using memory-training tricks. They will warmly welcome you back after each foray outside, and provide you with free drinks (lemon juice, corn-water) every time you enter, and whenever you sit in the lobby. The nearby Jade Hotel (17 Nguyen Thai Hoc) has the same ownership so includes the same standard of staff-training in simpler rooms ($15-20). Book a few days ahead (at either hotel) an* d they will pick you up from the train station. Hue is a safe city, and there is not much to worry about. As is common with other cities in Vietnam, at night time caution should be used with any offers of transportation. Motorbike drivers will drive up and offer to bring people (presumably men) to prostitutes or drugs ("Hey... Lady? Massage? Marijuana?") and can get quite surly. Cyclo-drivers, especially in Pham Ngu Lao area, should be avoided, as there are recent cases in which travelers have been mugged, beaten and robbed by these people. During the day a ride should be fine, but at night, especially when they say its free or "up to you" avoid them at all costs. Be suspicious of locals asking where you are from and then claiming to have family living there. The scam goes something like this. They will ask you to sit down for lunch/dinner/coffee with them and talk. After eating they will offer to pay for the meal and just ask that you buy them a local bottle of wine to drink at their temple. When you arrive at the local store the shop owner will say the wine is 7,000 dong and then when you attempt to pay she will say 700,000. Be suspicious also of women that need to change euro coins into dollars. After counting several times ther amount of euros, they try to keep some coins when they give you the money to change. Vietcombank ATMs do not accept bank cards with chip. Simply find an alternative. There is much discussion around ATMs in Vietnam and in particular about which ones allow a foreign traveller to take out more than 2-3 Million VND. The primary advice is that the Military Bank (MB) ATMs allow large withdrawals (5-8M). However, there are two issues in Hue with the MB ATMs. First, the the MB web site indicates there is an ATM on Vo Thi Sau, but there is not. Second, there is an MB ATM on Hung Vuong, between Le Loi and Tran Cao Van, but it only allows 3M withdrawal. Hoi An - old merchant port 100km away (about 4 hours by road or train - train a/c soft seats 81,000d as on 10/05/14, stops at Danang, will need to take local bus from there), with Da Nang, the Marble Mountains and China Beach as potential stops along the way. Dong Hoi - about 3 hours north of Hue, sleepy seaside town to sit around in. Bus from Hue (March '12): local bus: 80,000d / Sinh Cafe bus: 400,000d / Tourist buses: 300,000d. Beware of booking tickets mediated through people at the bus and train station or at "Adin's Café Booking Office" at the RR station. On arrival they ask you friendly how you like to continue your trip and then they want to make you believe to hurry as the train/bus is almost fully booked. Then they show you the "official" price list, which in fact it's just for tourists at a much higher price as locals pay for the tickets. Send them away and compare the ticket prices at your hotel and with other booking offices instead. There are also frequent bus services to Savannakhet and Vientiane in Laos. Buses leave at 06:00 and 18:00. There are 3 scheduled direct buses to Vientiane - 6:00 am, 9:30 am and 6:00 pm. The trip to Savannakhet takes about 12 hours and cost around US$12, to Vientiane about 14-18 hours depending how many stops bus makes and US$ 20-30. The vehicle can be anything between minibus, air-con bus to a local 30 years old bus. Usually buses packed with traders and their cargo that finding enough space would be a problem. You'll probably have to change bus 3-4 times during the trip and toilets (aside from squatting in the jungle) are seldom available. Tickets can be bought in any booking office in the center of Hue.